Having spent most of the Spring heavy into reading and listening to audio books on the war, I was looking for a game that I could play to help visualize (even if in an abstract way) and understand the war from a different medium. Paths of Glory, They Shall Not Pass, and Axis and Allies: World War I 1914 all found their way into my collection, but the cost to entry was steep. I teach a lot of the games I play and trying to teach something like Paths of Glory, not having a lot of experience in war gaming, seemed like a herculean feat. 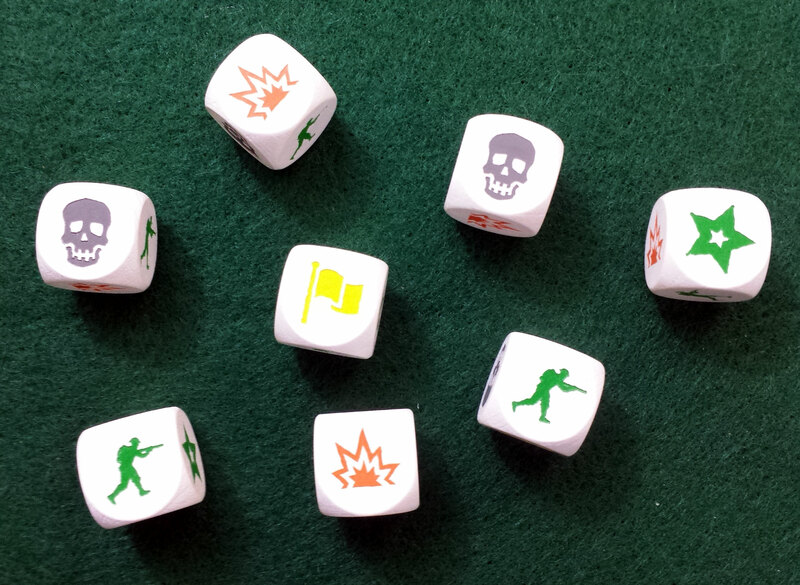 War games are also something that not everyone is into or willing to try, so finding players also factors in. When I found out about The Great War, I was equally elated and crushed. You see, I was late to the show and the Kickstarter campaign had already completed. Fortunately, when I posted my tale of sorrow in the BoardGameGeek community, some swell folks had an extra spot on their backer level and invited me to fill the opening. I was in! That’s the long-winded way of saying that I was tremendously excited when The Great War finally arrived on my doorstep last week. It’s not often that something I am researching collides with a hobby I am passionate about, and coupled with the ups and downs of trying to get a copy and waiting for it to arrive, it was a perfect storm that culminated in a somewhat awkward shuffle dance on the porch of our house last Tuesday. 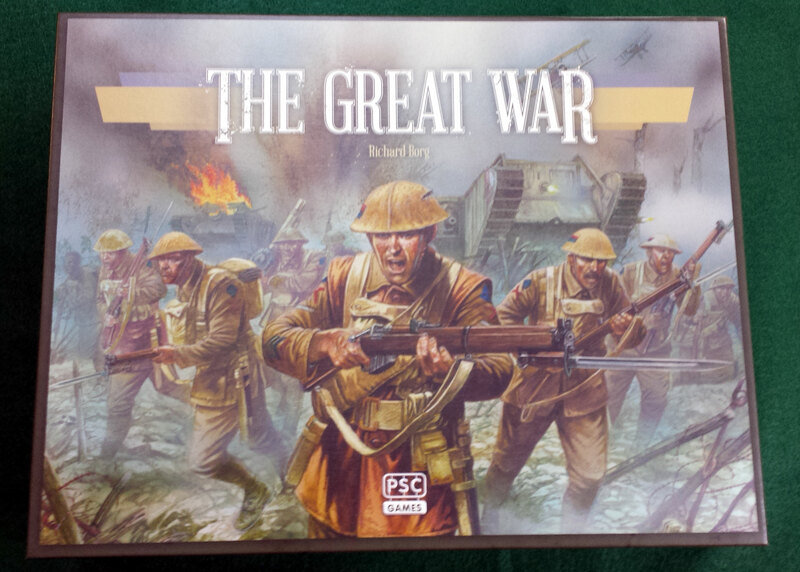 I plan on posting an in-depth look at the game, but interim, I thought (as I also really enjoy unboxing games, as discussed in, No Chickens Were Harmed: The Unboxing Ritual) I would share with you my initial thoughts as I unboxed The Great War. Artwork and Presentation: Peter Dennis did the illustrations for the game, with Sonar Design responsible for the art direction and graphic design. Initially, I wasn’t particularly impressed with the overall style and found everything a bit bare bones. As I began looking at the game as a whole, and with the idea that it’s conveying the style of the time it represents, it really started to come together and I have grown to appreciate the art and presentation quite a bit. While stylized, it has a realistic and gritty feel. It feels representative of something that you might find in a historical book about World War I, or a painting in a museum. This makes sense, as further exploration revealed that Peter Dennis is well-respected in the war gaming community for his contributions to both game art and historical books. The cover looks very period correct and that feel carries over to the cards. They are most certainly not busy, you might even call the art and text sparse, but what is there is very well done and they too feel like they fit with the period. They strike me as stylistically similar to the decorations or illustrations on a deck of cards you would find in the trenches. Cards: Those familiar with the Command and Colours system will immediately recognize the Command Cards. These cards allow to you order your units within the right, middle, or left sections of the board, depending on the card content. 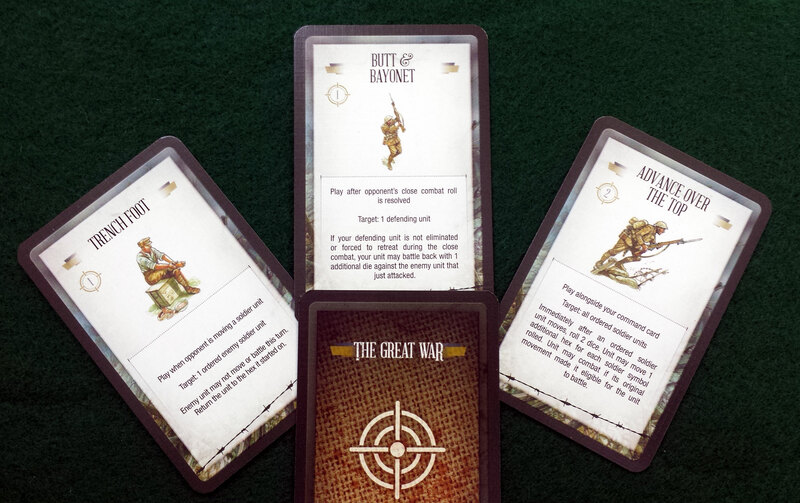 While the Command Cards might be the bread and butter of the system, the addition of a second deck, the Combat Cards, are one of two new aspects which have the potential to really set The Great War apart from the other C&C games. These cards can be used in conjunction, or in response to, the Command Cards and create the potential for a new level of strategic and tactical depth to the game. 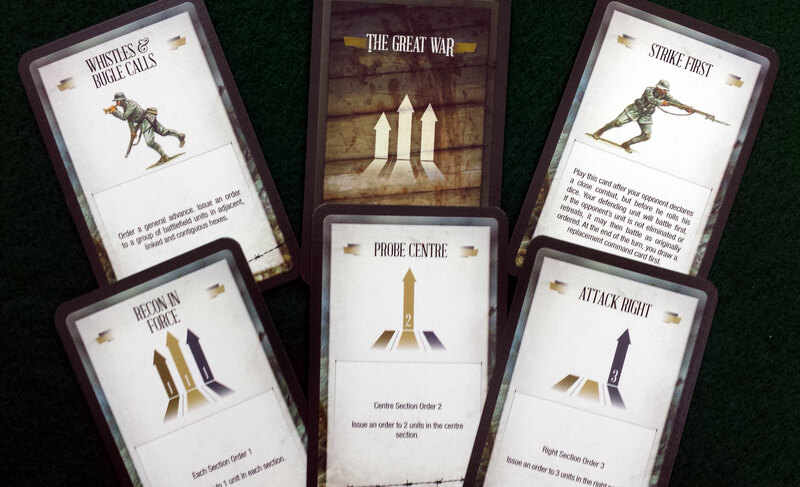 From my initial perusal of the deck, and as shown in the picture on the right, the cards seem to represent experiences specific to the period and style of war, as well as what the soldiers experienced. 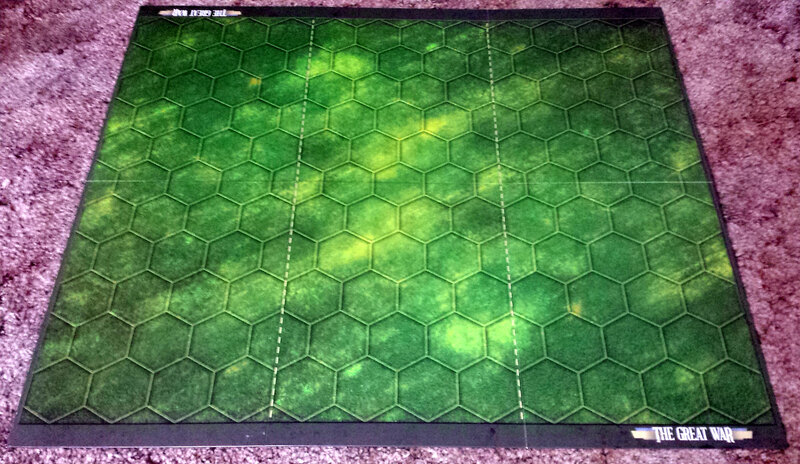 Game Board: Not a lot to say here, other than that it matches the style very well. The war-torn side definitely gives the feel of a destroyed section of land, much like almost all the battlefields would have looked. The Countryside section appears tranquil at first, but once shell craters start showing up, it will certainly trade its charm for a more somber, devastated landscape. 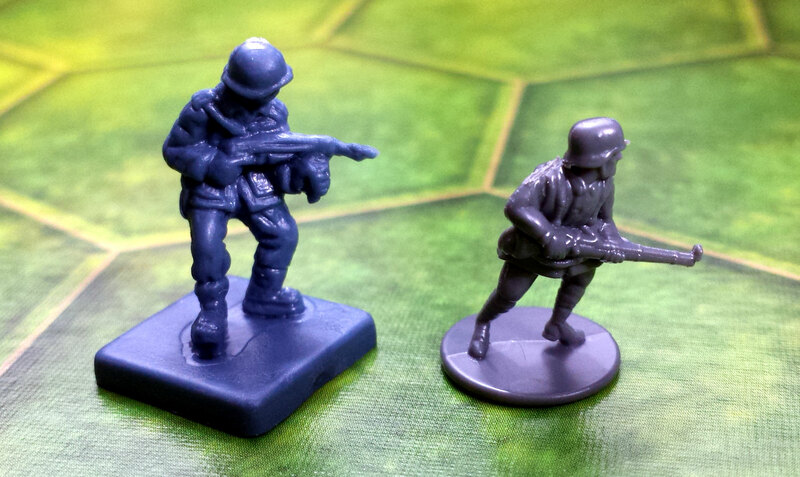 Miniatures and Components: The Plastic Soldier Company is, well, a company that specializes in plastic solders. As such, you would expect the miniatures to be exceptional, and they are very good. 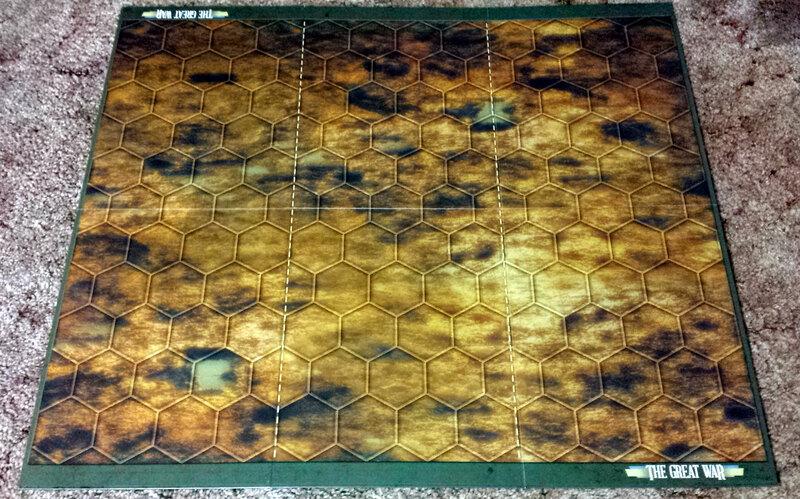 The scale is a bit smaller than the figures in Memoir ’44 and I am interested in knowing why, though I assume it’s simply to help with scale for the trench tiles, so they can all fit in the trenches without looking like giants in a drainage ditch. 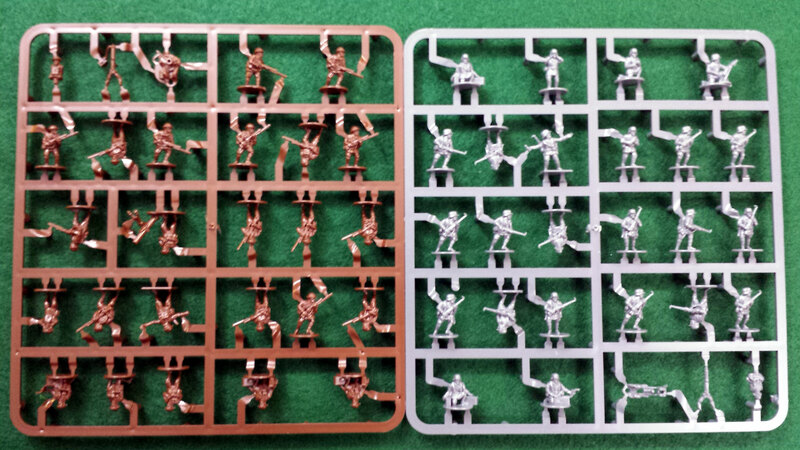 The game comes with three sprue’s each of British and German soldiers. A hard, model type of plastic was used for the figures and the forums over at BoardGameGeek have been buzzing about the choice of plastic and the fragility of some of the figures; specifically the British Infantry and the bayonets. I know that this is more of an unboxing and not a review, but I do want to divert a moment to provide some further detail and opinion since this is a hot topic. The miniatures do have to be clipped free and if you don’t have the right tools, previous experience with modeling, and a healthy dose of patience, this can be a frustrating activity. That said, it is by no means the end of the world, or all that difficult with the right tool. Buy yourself a good set of shears (I would highly recommend either or both: Tapered Tip and Micro Flush Cutters) and watch this helpful video, Don’t Bust your Bayonet – Removing Great War Pieces Tutorial, posted on BoardGameGeek. I only had one bayonet break, which was easily glued back and seems to be good as new. For those collectively heaving a heavy, frustrated sigh, snipping out the figures took far less time than it took to sticker all the blocks for Command and Colors: Napoleonics, and frankly, I think they look much cooler. Does it stink that this problem exists? Yes. It also bums me out a bit that I have to tout that I only broke one figure as this should be a non-issue, but PSC has acknowledged the problem and is working with folks that had major issues to find a suitable solution. At the end of the day, and after cutting out all the miniatures, it didn’t change my excitement towards the game, nor should it for you. 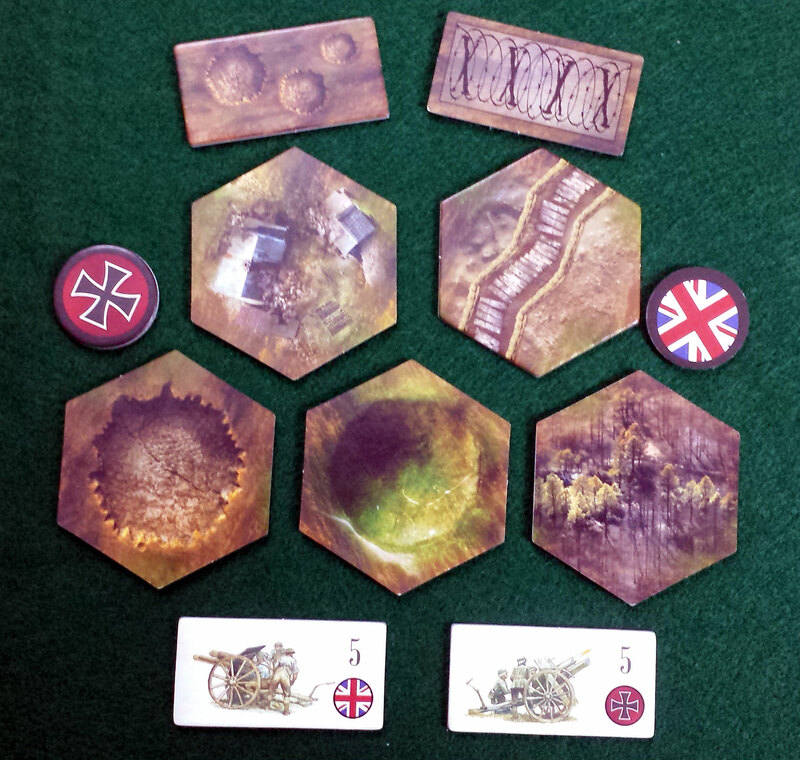 The cardboard components keep with the overall styling of the other parts of the game. What struck me different from some of the photo’s I’ve seen before, is how sturdy everything is. For whatever reason, the images I saw made the cardboard seem to be thin and I was initially very worried about this. It is not the case at all. 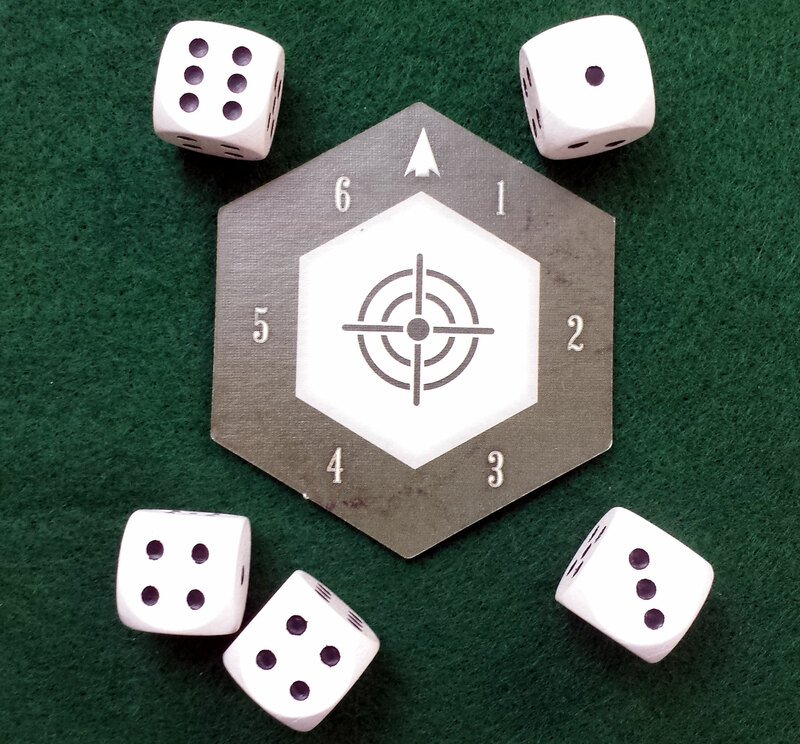 The tiles are the same thickness as the Memoir ’44 tiles and seem to be about a millimeter (got the metric reference in) larger in diameter. They punched cleaned from sheets and everything is top quality. I really like these double-sided reference sheets. Having one for each player makes it very handy for quick, in-game reference. 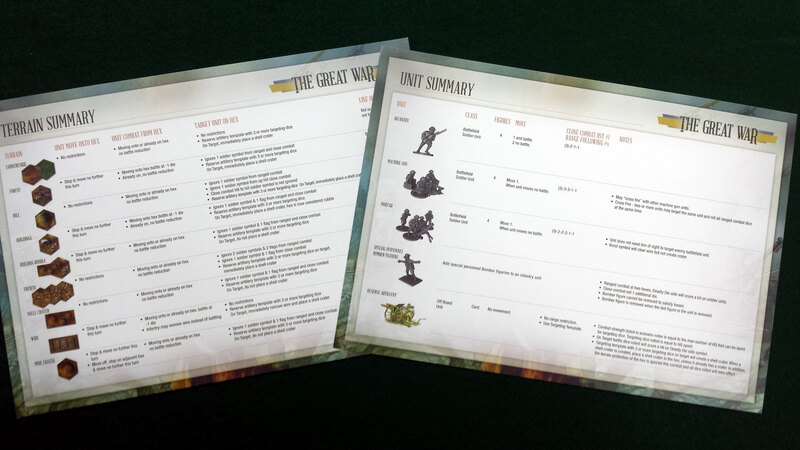 If you are at all a fan of any or all the games in the Command and Colour system, The Great War should have you excited. I couldn’t wait to get an opportunity to put this game on the table. At the time this article posted, I have one play under my belt, but don’t want to reveal anything until I get in a few more plays and post an in-depth review of the game as part two of this series (hint: It’s a really good game). Meanwhile, use the comments section to let me know your thoughts about The Great War, the Command and Colour system, or any of the games that use the system. If you are interested in learning more about Richard Borg and the development of the Command and Color system (switching to American English for this one), please take some time to listen to the episode of Ludology, The Battle Begins, where they interview Richard Borg about designing war games that appeal to a broader audience. It is an interesting listen and one of the best gaming podcast around. Roll well and groove on.